Here we are at the beginning of the racing season. The weather has warmed up, and it’s time to hit the road and get some training in. I’ve been hunting for an event or two to do before the Bolder Boulder 10K on Memorial Day. Sadly, a lot of the 5K, 10K and half marathon events in the Boulder area are on dirt; the dirt trails around the Boulder Reservoir and Coot Lake are very popular for running races. The racing wheelchair just doesn’t do well on dirt and gravel; it’s like trying to ride a high performance racing bike on that kind of surface. Fabulous! We’ve had wheelchair racers before, and we know just what to do! Fabulous! We’ve never had a wheelchair racer before—anything special that we need to do? Three or four days later I got response #3, with the added caveat that the course is very hilly, and that they wouldn’t be able to provide transportation from the finish line to the start line. In the meantime, I’d been reading runners’ reviews of the race, and people were pretty unanimous that this was an awesomely hilly course, especially the first 4-5 miles. They were also pretty unanimous that this is one of the most beautiful courses anywhere. A couple of days ago I packed the racing wheelchair up in the back of the car and drove to Fort Collins to see for myself. The course starts at the Colorado State University football stadium, on the west edge of town. Rather than parking right away, I drove the first five miles. 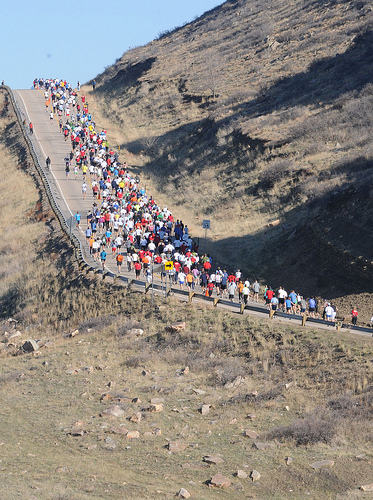 The first mile and a half is an immense switchback taking you up to the edge of Horsetooth Reservoir. The next bit goes along the dam, but then it starts up again. And up. And up. 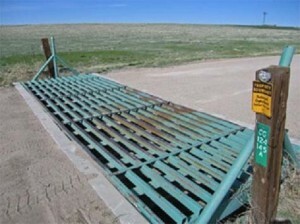 Pretty soon you see signs advising you that this is open range, and that means cattle guards. For the uninitiated, a cattle guard is a metal grid set in the road surface that cattle will not cross, because they will get their hooves stuck in them. Or maybe a racing chair wheel? At about mile 5 I turned around and drove back down. Driving down some of these hills made me nervous in the car! I argued with myself on the way about even trying any of it in the racing chair. But I’d brought the darn thing, and I was dressed to work out, so I parked at a trail head near the start and got going. Now if a runner is going up a hill and it’s too steep, s/he can jog, walk, or just stop. If I stop on a steep slope in the racing chair, I will either slide downhill or tip over backwards. I pushed, and pushed, and pushed, and pushed. Cars passed me. A couple of bicyclists passed me. I pushed some more. I looked at the cyclometer. It said 0.3 miles. I pushed a little more, looked up at the vast expanse of hill ahead of me, and turned around. Downhill looked just as scary. I rode the brake all the way down, got back in the car, and cried a little bit. When I got home, I emailed the race director to apologize for wasting his time. Check out The Trail Goes on Forever for Jen Allen’s recap of the Horsetooth Half from a runner’s perspective. Thanks for linking to my blog. I’m so sorry the Horsetooth Half isn’t more accomodating to your needs. I am impressed that you tried that course, as it can be scary especially on the downhills as you mentioned. Don’t give up! There are bound to be alternative races for you to try right here in Colorado. You are in inspiration. Good luck! Thank you for recapping it! It was a big help to me before going out to see the course. 2. I can’t believe you came to FoCo, but did not stop by. The crewing offer is super sweet – we should definitely do that. I don’t think those hills are going to get any smaller, though.